First a little background on the problem I needed to solve. I use the Google Calendar extensively. In addition to the regular events I put on my calendar (lunch with friends, doctor appointment, anniversary), I also put reminders for tasks that need to get done. I realize that Google already has a Tasks list for this very purpose. Call me crazy but I find it easier to whip out the Calendar app on my phone and insert a new event. The only problem is that I also procrastinate. Weeks will go by and the task’s calendar event is still languishing on my Calendar. At the end of every month, I have to clean up my Calendar and decide which tasks are actually important or not. The ones that are all have to be moved to the next month. :. (colon period) = Unimportant event, advance yesterday’s unimportant events to next month. :! (colon exclamation-point) = Important event, advance yesterday’s important events to today. :? (colon question-mark) = Semi-important event, advance yesterday’s semi-important events to next week. :- (colon dash) = Unwanted event, take it off the calendar and put it in the TasksFreezer Tasks list. :+ (colon plus) = Wanted task, take it off the TasksFreezer Tasks list and put it on the calendar today at noon. If you want to use the Calendoo script, read on for an explanation of how to set it up. Click on the link at the bottom of this blog post. The Google Apps Script IDE page should open up showing the Calendoo code. Click the [File] menu and choose [Make a copy]. The Calendoo script should be downloaded to your own Google Drive. Access it by going to drive.google.com. The Calendoo script file should be in your root folder. Click on it to open it. At this point, you may have to go through a wizard for installing Google Apps Scripts in Google Drive if this is your first time using them. The Google Apps Script IDE should open again, this time with the Calendoo script installed in your own Google Drive. Next, click on the [Resources] menu and choose [Advanced Google services]. An Advanced Google services dialog will appear. Next to Tasks API, click the radio button to turn it on. This allows the code to access Tasks API functionality (used for managing Task lists in your calendar). Now you will need to enable the services. 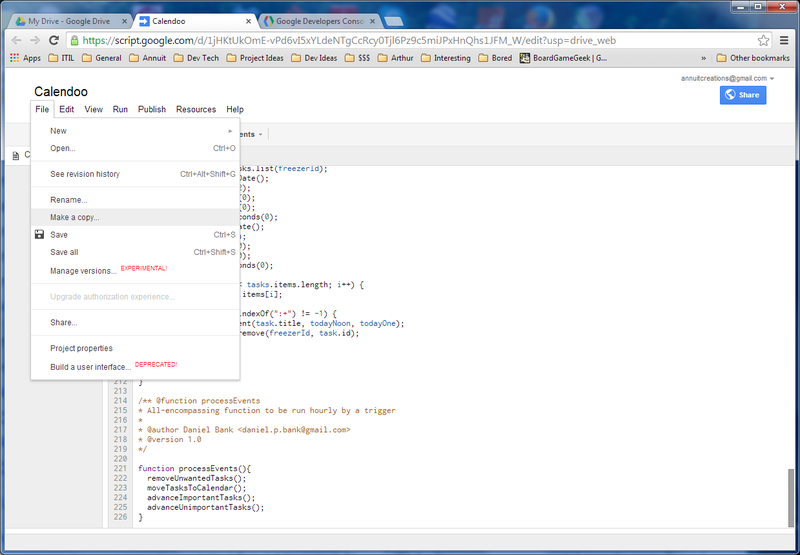 Click the [Google Developers Console] link at the bottom of the dialog. The Google Developer Console website should open. 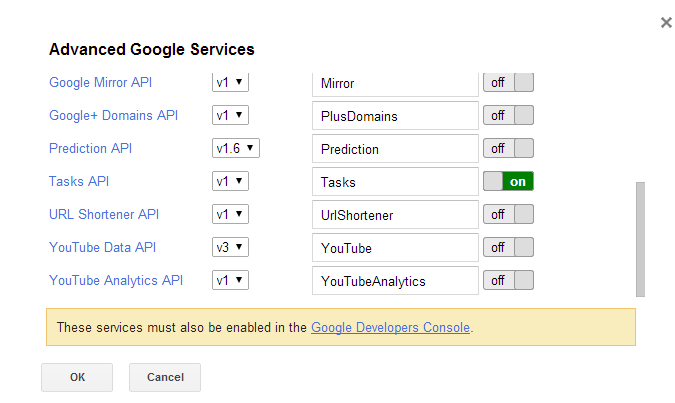 In the list of APIs, click the radio buttons next to Calendar API and Tasks API to turn these services on. Now close the Google Developers Console page and the Advanced Google services dialog. Back in the Google Apps Script IDE, we need to run a function in the Calendoo script so it can request permissions from you the user (yes, this step is a little strange, I know). Click on the [Run] menu and choose the [processEvents] function. A dialog will appear saying, “This app would like to: manage your calendars, manage yours tasks, view your tasks”. Accept the dialog and it will close. The Calendoo app is ready for action, we just need to pull the trigger. To create a trigger to run the script periodically, click on the [Resources] menu and choose [Current project’s triggers]. A dialog will appear with a link, “No triggers set up. Click here to add one now”. Click on that link. The dialog will now show the options for our new trigger. Choose to run the processEvents function. This is the main function that drives the entire Calendoo script. Make the event Time-driven and set it to run everyday at Midnight to 1am. This will cause the processEvents function to be executed everyday at midnight, pushing yesterday’s events forward. Click Save. The Calendoo script is now completely configured for your Google account. Hurrah! I hope you enjoy the Calendoo script. Click here to view the Calendoo script and use it for your own Google Calendar.